Haniel Long was an American writer known primarily for his prose writing but at least two collections of poetry were published under his name. He was also a teacher of English and contributor to a newspaper called The New Mexico Sentinel where he edited the writers’ page, thus continuing his efforts to encourage new writers. He had begun that task when he and his wife moved to Santa Fe in 1929 and Long was responsible for a publishing outlet called “Writers’ Editions”. He had two titles of his own published by the same organisation: in 1933, a collection of poetry called Atlantides and, two years later, they released Pittsburgh Memoranda. In 1936 came the piece of work for which he is most famous. Interlinear to Cabeza de Vaca was a novella telling the true story of a Spanish conquistador’s arrival in North America during the 16th century, although it was published as a work of fiction. He was born Haniel Clark Long on the 9th March 1888 a long way from America. His parents were Methodist missionaries working in the Burmese capital of Rangoon. When Haniel was three the family moved back home and settled in Pittsburgh. His education was started at the Phillips Exeter Academy and completed at Harvard University. Haniel displayed such admirable qualities as a writer that he was engaged as a reporter by the New York Globe for a time. He was, though, keen to return to his home in Pittsburgh and did so when he secured a teaching post at the Carnegie Institute of Technology. By 1920 he was Head of the English Department and a published author. Like many poets before him he gave his first collection of verse the simple title of Poems. Six years later he had a collection short stories published called Notes for a New Mythology. These stories had dream-like, fairy tale qualities. For health reasons Long decided that this would be his last move. Believing that every man has a certain place in the world, wherever that might be, he wrote Interlinear to Cabeza de Vaca which told the story of a traveller from Spain finding his way across the ocean to the strange new land of North America. The book was published in 1936 and brought the author a great deal of acclaim. He published at least another seven titles over the next twenty years including Walt Whitman and the Springs of Courage, published in 1938 and A Letter to St. Augustine in 1950. In between working on his novels he was a regular contributor to the New Mexico Sentinel, and he encouraged new writers to send stuff in for the Writers’ Page. He was working right up to the end and he managed to finish his final novel only just before he died in 1956. Spring Returns was one of three posthumous titles, the others being If He Can Make Her So, published in 1968 and My Seasons in 1977. 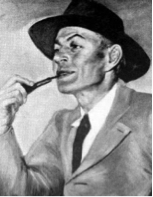 Haniel Long died on October 17th 1956 aged 68.